John James Audubon (1785 - 1851) commonly known as James is considered “the patron saint” of American wildlife. The famous Audubon Society was named after James. Born in Haiti and raised by his stepmother in France, James was interested in drawing and birds. Here he studied art. At 18, he was sent to America to take refuge from the French Revolution. Living on a family estate in Pennsylvania, James studied, hunted and drew numerous birds. He married Lucy Bakewell, fathered two sons, and became a successful dry-goods businessman. A decade later, when hard times hit, this resourceful man re-invented himself as a naturalist and bird artist. He traveled the American frontier extensively with an assistant, artist materials, and a gun. The publication of his 435 –plate “Birds of America” in 1827 was an immediate worldwide success. By all measurable means, this was the greatest work on birds ever produced. Using the highest standards, James had meticulously detailed the birds with an exact draftsmanship. Forced to draw the birds from specimens, he used his remarkable talent to capture the vitality of each bird as if it were alive. He did take a few liberties with the truth. 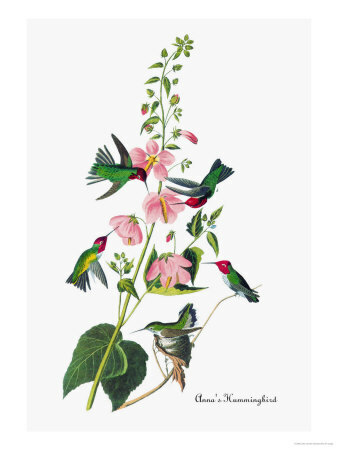 For example, in one of his drawings, "Ruby-Throated Hummingbird", we see a dozen Ruby-throats gathered around one flower. Normally we should see only one. 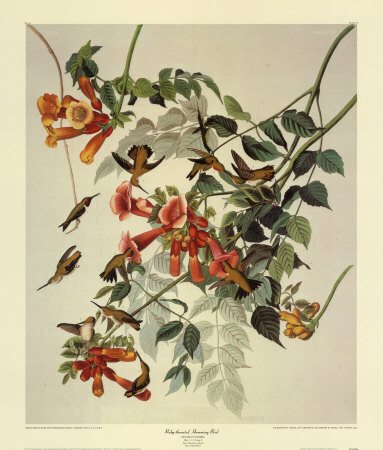 Audubon wrote about birds in his own words and wrote emotionally about the Ruby-throated hummingbird. “Who on observing this glittering fragment of the rainbow would not pause, admire, and instantly turn his mind with reverence toward the Almighty Creator”, James Audubon. He drew the "Anna’s Hummingbird" in gorgeous style. His drawings of the Anna’s are among my favorites. All of his drawings hang in the best museums. Plates from the earliest edition, original hand-colored prints sell on the internet for $100,000 or more apiece. It is possible to purchase affordable prints by this artist and naturalist. Today, the name Audubon remains synonymous with birds and bird conservation all over the world. The appreciation of the artist for hummingbirds will always be undeniable.